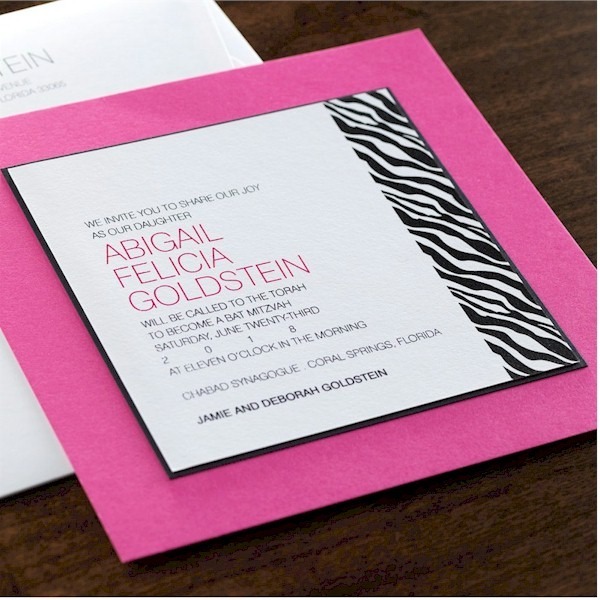 Produced by Checkerboard, this fun and festive Bat Mitzvah invitation will get your guests excited for your big day! Alternate backer colors are available. 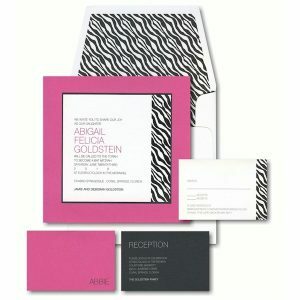 This contemporary layered Bat Mitzvah invitation is printed on bright white card stock and features a wild animal print along the right side. A middle layer of Jet-black card stock narrowly peeks out from behind the white invitation card, and a bottom layer of Watermelon-pink stock gives this ensemble a fun and festive appearance. Measures 6-3/4″ square. 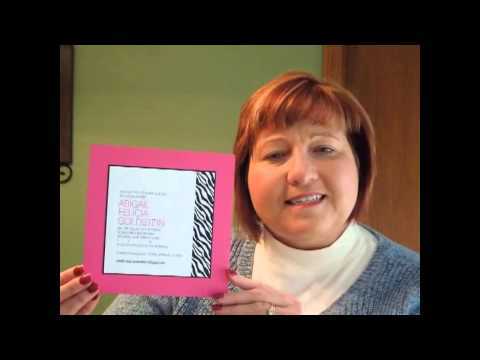 Shown with Black and Raspberry inks and lettering styles Swiss Thin & Swiss. The bright white handcrafted envelope is displayed with the Mansart style and decoration DEC1361. The matching reception cards will print on Jet-black card stock, the response cards will print on bright white card stock with coordinating animal print, and the Informal notes will print on Watermelon-pink folding stock. Use the links below to format each line of text.